The strange thing about course ranking lists in golf magazines is that, while I never completely agree with the order of things, I always read them to see what the voters have come up with. 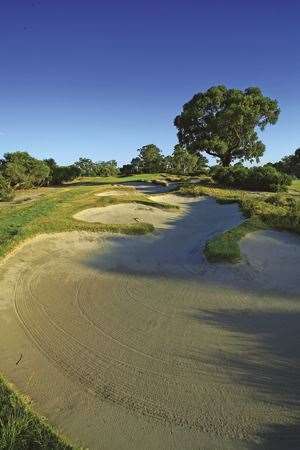 One of the great holes in Australian and world golf, the par-3 15th at Kingston Heath. I’m sure there are ten courses in the world better than this one. But there aren’t ten I’ve enjoyed more. This course is like a mini-Pine Valley. I love the old-time atmosphere amid the heather and the trees. It just feels right and is the way golf is supposed to be away from the coast. Everything is natural. And if I had 150 acres in my garden I’d want it to look like Swinley Forest. It also happens to have 18 really good holes. It is short by modern standards, though. If I played it every day I would have to do so with a limited set of clubs, or with persimmon woods and balata balls. That would be perfect … and huge fun. I even love the sight of the pompous old guys wearing tweed jackets with the leather patches on the elbows out walking their cocker spaniels. That also adds to the overall experience. I’m just an old romantic at heart, I guess. Again, the word ‘fun’ comes to mind. I would never get bored playing here. There are interesting shots all the way round, starting on the first tee, which is in the town just like St Andrews. But is it less organised than the Old Course. The tees and greens seem to be a bit more haphazard in their relationship to one another. So you have to work it out as you go. Coming back, that feeling returns over the closing holes. There are people out having picnics and walking their dogs across the fairways. You have to give way to the townsfolk. It’s just great fun. It’s not necessarily easy, though. Even on a nice day, you could put the pins in spots where even good pros would have trouble breaking par. Or you could put them in places where everyone would shoot six-under. It has something for everyone. North Berwick also has what a friend of mine calls “the shortest par-5 in golf” at the 16th. That hole has the most absurdly brilliant green I’ve ever seen. No one could get away with building it now. But I’m not sure why because it is so much fun. There’s that word again.